LONDON, England (CNN) -- When Michael Phelps lost his first major individual competition in four years at the World Championships in Rome it was a defeat which could help define the sport for decades to come. 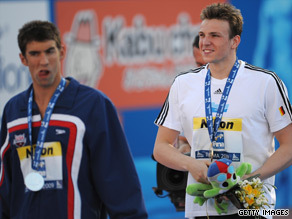 Michael Phelps ponders his second-placed finish behind Paul Biedermann at the World Championships in Rome. Paul Biedermann finished ahead of Phelps, who won eight gold medals at the Beijing Olympic Games, with a new world record in the 200-meter freestyle - but the win was marred with controversy. Biedermann was wearing the Arena X-Glide polyurethane suit, considered faster than Phelps' Speedo LZR Racer, which gave him an extra advantage in the race. Biedermann was not only able to finish ahead of Phelps, he also smashed Australian Ian Thorpe's seven-year-old world record in the 400m freestyle in an earlier race. Indeed, since the introduction of polyurethane suits in 2008 a drastic improvement in times has been possible and world records have fallen at regular intervals. So how have these swimsuits been able to give some competitors the edge? The high-tech, full-length swimsuits are coated in neoprene, polyurethane or a thin layer of bio rubber which gives added buoyancy. The riblets on the surface of the main fabric trap microscopic water molecules, creating an effect of water moving over water that reduces the drag and keeps water friction close to zero. Modern suits are also form-fitting and are exceptionally light yet compressive so swimmers have been able to knock large chunks off record times. At least 150 world records have been lowered since February 2008 when Speedo launched the LZR Racer which revolutionized the sport. Although, they have found their 50 percent polyurethane suit overtaken by the 100 percent polyurethane wear such as the Arena X-Glide worn by Biedermann. One of the major problems faced by swimmers with regards to the suits is that they may have existing sponsorship agreements which prevent them from using the suit of a rival company. The knock-on effect is that as soon as fresh technological breakthrough is made by one firm the opposition are blown out of the water. So, by using in Speedo's LZR Racer, Phelps is effectively swimming in yesterday's suit - at least until they are able to come up with technology to match the developments by their rivals. The suits have divided opinion in the swimming world with calls for performance-enhancing equipment to be banned. Among the critics is Phelps' coach Bob Bowman who hinted after the defeat in Rome that he may withhold his man from international meets until the playing field is a level one. FINA - the sport's governing body - have made clear their plans in response to the criticism with a return to common textile in suits defined by a group of scientific experts led by Professor Jan-Anders Manson, from the Swiss Federal Institute of Technology in Lausanne. There will be uniform permeability, no modification for individual swimmers who will only be able to wear one suit with no taping allowed while thickness and buoyancy are also to be reduced. Also FINA reduced the area of the body which the suit will be able to cover. For men, it will not extend above the navel nor below the knee, and for women, shall not cover the neck, extend past the shoulder, nor extend below the knee. Ultimately the back-to-basics approach from FINA means the excitement of a world record being broken is likely to become less-common phenomena, but it will see a welcome return to competitive and fair races. Although, it will not be implemented until April or May 2010 to allow manufacturers time to make the transition - and some unbreakable records to be set.